Try Grammarian PRO2 Free Online Grammar Check: Academic Rules -- (linked to Grammarian PRO2 X grammar engine: Check grammar, spelling, and punctuation online. References: The Chicago Manual of Style, 16th Edition, The Elements of Style, William Strunk--Note: Recheck your corrections. Do you like the free grammar check above? Please LIKE if it has helped. 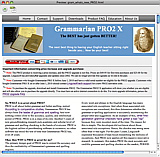 Grammarian PRO2 X, the best professional writer’s tool, is the ultimate writing tool to combat those embarrassing writing errors that everyone tends to make, a universal interactive grammar check, contextual spelling check, punctuation check, dictionary, thesaurus, AutoCorrect, and AutoType tool that virtually works within every program on your computer. Grammarian PRO2, originally conceived in the early 1980’s, has created all standards by which others attempt to copy. We INVENTED the "Contextual Spelling Check" (in 2001) and "Contextual Grammar Check" (in 1986). Let Grammarian PRO2’s grammar check watch your back! Grammarian PRO2 is the best. Download a free trial version of Grammarian PRO2 today and see the best grammar check for yourself. Check grammar and check spelling here, there, and everywhere. Wherever you write, Grammarian PRO2 is there. Grammarian PRO2’s features are universally available, anywhere you enter text, in all applications-word processors, email, web browsers, and all other applications. Easy and powerful. Convenient and easy to use. All commands are accessed from a global universal Mac OS X system menu. Automatically save time and keystrokes. With Grammarian PRO2’s AutoType, you type a few letters and Grammarian PRO2 automatically expands them. Save precious time and keystrokes. Insert standard greetings, phrases, and signatures as formatted text. Correct typos automatically. Insert the current date and time in any preferred format. And do so much more. Qualified and reporting for duty. Whether you are writing an email, a school class essay, scientific article, or your PhD Doctoral Dissertation, Grammarian PRO2 will assist you along the way. Remembering all the proper grammar and spelling rules can be difficult. Implementing those rules is another matter entirely. Let Grammarian PRO2 help you. 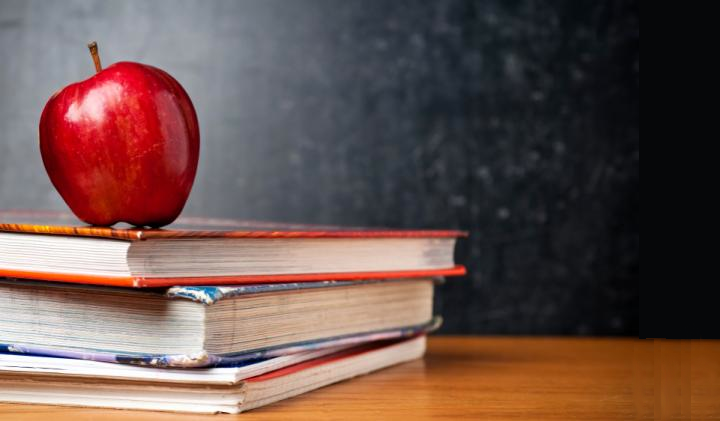 After all, Grammarian PRO2 has over 30 years of dedicated educational research and is qualified to assist you. Grammarian PRO2 X checks grammar, spelling, punctuation, style, phrase usage, readability, and more. Grammarian PRO2 X reads through your text and analyzes each sentence for potential grammar, spelling, and punctuation problems. Has over 300 built-in primary grammar, spelling, and punctuation check writing rules compared to MS Office's 26 error corrections. Checks homophones-words that sound the same but are spelled differently such as it's for its, accept for except, loose for lose, to for too and two, and many more. Reference aid displays grammatical parts of speech and linear sentence diagraming, to assist with evaluating the right choice of corrections. Check spelling interactively as you type or all at once after you type. Grammarian PRO2 works in word processors, email applications, and web browsers, almost anywhere that you can enter text. Write faster, better, and with more confidence using Grammarian PRO2's extensive AutoType and AutoCorrect features. Grammarian PRO2 corrects typo mistakes, grammar errors, spelling errors, punctuation errors in or out of context, phrase usage, and punctuation errors. Grammarian PRO2's AutoType feature will save you much time by typing your commonly-used words, phrases, and paragraphs for you. Conveniently look up words, meanings, and more, using Grammarian PRO2's built-in dictionary and thesaurus. Quickly modify and clean up text. Analyze your writing using Grammarian PRO2's statistics and statistics analysis functionality. Grammarian PRO2's grammar check works interactively or in batch correction mode and automatically starts working in your applications to correct spelling, grammar, phrase usage, and punctuation. Use the built-in dictionary assistant to look up definitions and verify the correct choice of words. AutoCorrect corrects many spelling mistakes automatically as you type. Also, create styled-text AutoType shorthand macros that will automatically type your commonly used signature phrases. Checks your spelling, grammar, phrase usage, and punctuation interactively as you type! When interactive checking is turned on, Grammarian PRO2 watches what you type so you can make corrections as you are writing. Grammarian PRO2 can alert you when an error is detected with your choice of selectable sounds or voices. You can set different alert sounds for each error type. Whenever Grammarian PRO2 sees that you have made an error, a list of suggested words appears. You can choose to see the list in a window or in a pop-up menu list. The list is comprehensive; and so, when you find the correct word, simply double-click it with the mouse or type in the number beside the right word. Grammarian PRO2 will instantly and automatically type the correction for you. To check your document after you've finished typing, use Grammarian PRO2's 'Check Selection...' command. 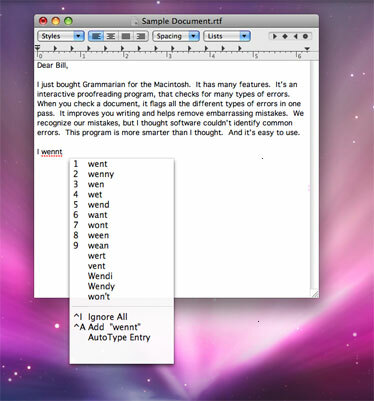 Grammarian PRO2 pastes corrections into your document all at once. Interactive checking and after-the-fact checking aren't mutually exclusive. Let Grammarian PRO2 check your grammar and spelling as you type and also check your grammar, spelling, and punctuation afterwards all at once just before you send off your document. Grammarian PRO2 maintains all style formatting in your documents. Web browser copy/paste grammar checks do not maintain document character formatting. Only Grammarian PRO2 keeps all document character formatting intact. Academic, business, professional, publishing, technical, and creative writing require unique styles of editing. Grammarian adapts to your writing needs and ensures that no whatever your project is, your grammar is ideal. Just choose the grammar writing style of the piece of writing that you need edited. Download Grammarian now to get started. Grammarian PRO2 is the best. Let Grammarian PRO2 fix typo mistakes, smarten punctuation, finish what you've started to type, and do the repetitive typing for you. Automatically, instantly, invisibly-often without you even noticing. Grammarian PRO2 can save many hours of typing and wear and stress on your hands and wrists-all by typing for you. Using Grammarian PRO2's AutoType typing expansion feature, you can create self-expanding AutoType shorthand abbreviations that save you typing and ensure spelling consistency. Create hundreds of shortcuts to boilerplate text responses, long URLs, entire signatures, addresses, names, phrases-anything you find yourself typing repeatedly. Grammarian PRO2's AutoType shorthand expansions can include dates and times, formatted almost any way you'd like. Grammarian PRO2 automatically corrects many commonly misspelled words and typo mistakes. Grammarian PRO2 includes a list of over 4,000 common typos (for US English) and spelling mistakes. Add your own automatic corrections-there's virtually no limit of the quantity that you can create and use! Let Grammarian PRO2 automatically fix those DOubled CApitals, capitalize the first word of a sentence, and fix capitalization of proper nouns-instantly and automatically. Write like a professional-have Grammarian PRO2 automatically "smarten" quotation marks and other punctuation to be typographically correct. Grammarian PRO2 does it all. Use Grammarian PRO2's thesaurus to find synonyms and related words. 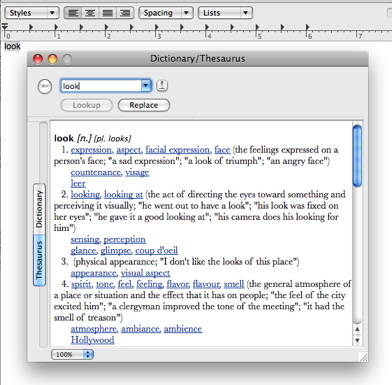 Grammarian PRO2's built-in U.S. English thesaurus offers over two million entries for almost 250,000 words. 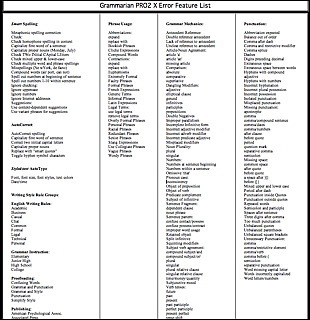 Entry words contain definitions and parts of speech. Finding the right word couldn't be easier. Look up the word selected in your document, or look up a word that you type into the Lookup window. According to comparative studies, Grammarian PRO X has always been the leader of grammar checking and spelling checking. And now again, nothing comes close to the accuracy, quality, and intellectual power of Grammarian PRO2. Grammarian PRO2 has the most comprehensive grammar error checking capability. Nothing has ever matched Grammarian's completeness. You rely on the creditability of the grammar checking and spell checking application, and accuracy is the key to creditability. And Grammarian PRO2 has over 300 built-in primary grammar check and spelling check writing rules compared to MS Office's 26 error corrections. Grammarian PRO2's error checking is categorized into writing rules and writing styles. This allows you to customize Grammarian PRO2's grammar check according to your current or projected writing style. Errors are grouped into phrase usage, grammar mechanics, and punctuation. Check for stylistic phrase usage errors such as Bookish Phrases, Cliches, Compound Words, Euphemisms, Formal, Faulty, French, Generic, Informal, Latin, Overly Formal, Racial, Redundant, Sexist, Collegiate, Vague, Wordy, Legal, and more. Check for textbook reference errors as Grammar Mechanics. Grammar check errors of this type now range from elementary to undergraduate course study. The grammar check error classes of this type include Misplaced Squinting Modifiers, Dangling Modifiers, Missing Prepositions, Subject-Verb Agreement, Antecedent Reference, Improper Parallelism, Double Negatives, and so many, many more. With over 30 years of research and lab work, Grammarian PRO2 provides you with the most sophisticated selection of error checking ever. This is capable only because of Grammarian's underlying Linguistic technologies and innovative connective algorithms designed and owned by Linguisoft. Decades of research and innovative design make this possible. Simple Natural Language Processing, Generative Grammar, Structural Linguistics, and Cognitive Linguistics are primitive caveman terms compared with today's standards of Linguisoft's Grammarian PRO2. Grammarian PRO2, the most powerful spell checking in the world, includes contextual spell checking and additionally checks for such spelling errors as: word compounding, homophones, spelling out numbers in a sentence, capitalizing of proper nouns, and more. ONLY Grammarian PRO2 even makes spelling suggestions based on how words are used in the sentence. Have you ever used the word it's as a possessive pronoun when you meant to use its. Or maybe you wrote to complement someone instead of compliment them. Well, these words are not misspelled but the spelling is incorrect depending on the context that the words are used. Grammarian PRO2's grammar check spots correctly spelled words that used in the wrong context. No more embarrassing typos like it's-its, complement-compliment, then-than, to-two-too, lose-loose. Homophones are common grammar and spelling errors. And common spelling checkers cannot catch these errors. Grammarian PRO2's grammar check easily catches them, and other than a trained human editor, ONLY Grammarian PRO2 catches them. If you are a dyslexic typist, Grammarian PRO2 now helps you more than ever. Grammarian PRO2's grammar check and spell check has the most comprehensive homophone checking ever. Nothing has ever before been successfully capable of checking and correcting these types of grammar and spelling errors. Multiple languages simultaneously, available everywhere. Use Grammarian PRO2's Statistics to determine your document's readability, along with the number of paragraphs, sentences, words, characters-even syllables. Check how interesting your writing is (Human Interest) and how difficult it is to read (Reading Ease). And let Grammarian PRO2 show what famous writing that is comparable with your writing. 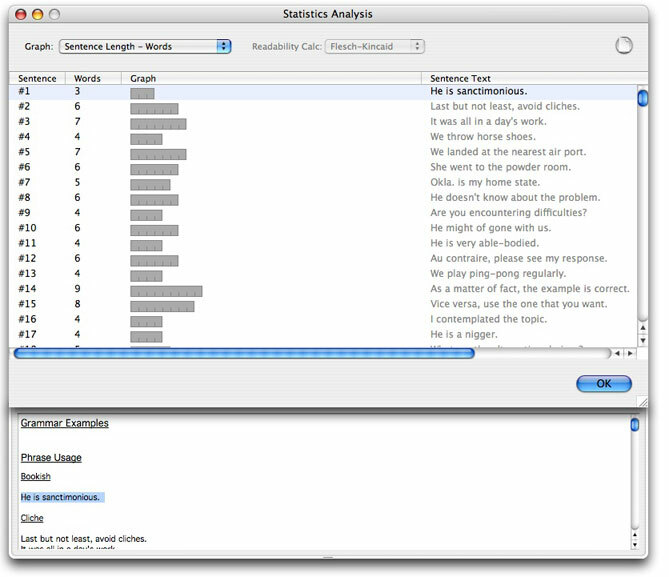 Use Grammarian PRO2's Statistics Analysis to show sentence-by-sentence graphs of Sentence Length, Human interest, Readability, Passive Sentences, Nominalizations, and Coherence words and phrases. Write, edit, and review. Use Grammarian PRO2's professional Statistics tools to review your writing in order to target your audience. General info on Grammarian PRO2. 11/8/18 Notice Mojave 10.14.1 users: Apple just released an update with a bug that affects Grammarian PRO2. See this. Try Grammarian PRO2 before you buy. Read first: "Buy Now" routes you to the store. 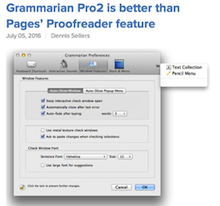 The Grammarian PRO2 product is available as a Mac download-only app. The download is a 7 day free trial commercial demo. Buy a registration license to unlock the demo into a full nonexpiring licensed copy. Sale is final once an activation code has been purchased and issued. No returns. For Mac Only. Ray Willhite: I love your program. Shelden Curry: I love this product. Didn’t realize how much til I lost it! Daniel Wade: I’m a looooooong-time customer of your company. Lavoie Jean-Pierre: I love Grammarian. Martin Kaynan: I love it! Carolyn Carlisle: I credit Grammarian for helping my children improve their grammar. Penny Cherubino: I do love the product and would like to continue to recommend it to other journalists. Jamey White/Apple Computer/Lead Technical Editor: My team has a 35-seat license for Grammarian Pro. 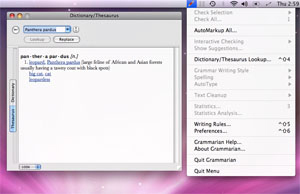 We're all working on OS X Mavericks, using Grammarian Pro 2.0.6. Patti Bradfield: You have the best product on the market and the best BEST customer service. Rick Wilson: Thank you so much. My life would not be the same without your wonderful program. Grammarian PRO2’s grammar check finds and corrects hundreds of thousands of complex writing errors — so that you don’t have to! Once installed on your computer, the Grammarian PRO2 X Grammar Checker is only one click away, wherever and whenever you need it. Checking grammar has never been easier. 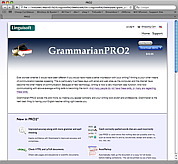 Grammarian PRO2 X takes full advantage of Mac OS X and also works in such Mac OS X applications as: Apple's Pages, Apple Mail, BBEdit, iBooks Author, Mellel, Microsoft Office, Nisus Writer Express, Scrivener, TextEdit, and many more. Grammarian PRO2 helps you to write mistake-free on Gmail, Facebook, Twitter, Tumblr, LinkedIn, and more. Grammarian PRO2 X grammar checker is the original and first true grammar checker. Now after over 30+ years, Grammarian PRO2 X grammar checker is not only the world's first grammar checker; Grammarian PRO2 X is the best. Grammarian PRO2 X is what the PROs use. Improve your writing now! Grammarian PRO2 X for the Mac works offline without an internet connection. 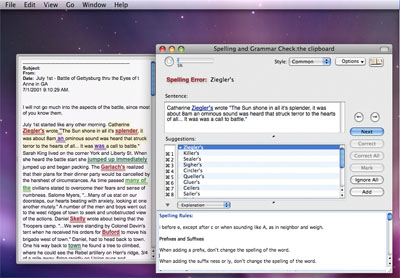 Grammarian PRO2 X is a seamless integration of the Mac operating system and your work flow. Grammarian PRO2 has the best grammar check ever. Grammarian™ patents, trademarks, trade secrets, and copyrights are exclusively owned by Linguisoft Inc. All rights reserved.